Here it is in July and I have another one of my dodging games to share. But, this one is a little bit different. You don�t need to dodge all of them, or in this case go through all of them. Nevertheless, if you want the juicy bonus points, you need to grab as many of the blocks as you can. The twist is how the pylons change as you play. 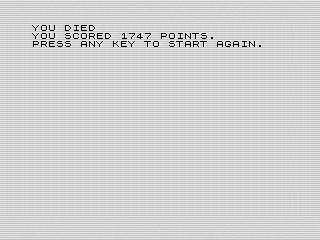 Pylon V, much like last month�s Death Maze, is a vertical scroller. Much like that game, you use Z and . to maneuver between the pylons. The black blocks within in them act as score multipliers. You get a bonus after each run based that keeps accumulating. At first, the pylons are nicely spaced. They don�t line up though, which can make things a big tricky. The pylons are also two bricks wide, making it harder for your ship to fly through them easily. As such, I often would skip the pylons that were two far away to safely navigate. After a set number of pylons, you complete a run and get your bonus points. The game doesn�t stop. Instead, the twist kicks in, making the game a bit more difficult. The twist is the pylons move closer together after each successful run. As designed, the game starts slow and feels rushed as the pylons increase in frequency. Playing it again, I felt the game to be a bit boring. But, the longer I played the more interesting it became. In fact, the game is almost impossible once the pylons get too close. They fill the screen making it hard to dodge them, or get bonus points. See if you can beat my high score in the screenshot. There isn�t much special to share in Pylon V�s code. The ship and pylon are stored in variables. A series of loops manage the run and distance between pylons. A loop check if you hit anything, death into the pillar or an added bonus. Nothing new here. I didn�t need to make any changes as it played fine from the start. In fact, the game is me stitching things together in a different way. The effect of which is a decent game, even if the beginning could be a bit faster. There isn�t much I�d change, except speed it up. 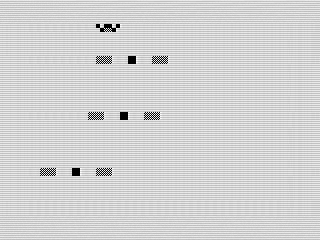 It wouldn�t be hard to convert into an MCoder II game, which would improve the speed and smooth out the scrolling. But, if I did that, I�d need to review the pylon spacing. With July coming to an end, I�m already thinking about August. My dad found one of my old ZX81 designs for a golfing game that I never finished. After think gin about it, the images would make for good article. Until next time!